The Speed Vest is one those devices that looks good in concept, but I’m not certain if it will work in practice. 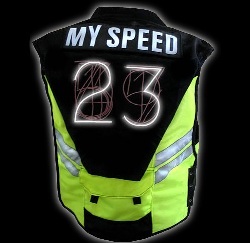 It is a simple device that spells out your speed limit on your back, as if you’re wearing a team jersey with ever-changing numbers. This Do it Yourself Project is designed by Brady Clark and Hykle Hansen. The vest is powered by an Arduino computer, an open-source embedded platform that is powered by an Amtel microcontroller. As for the display itself, it uses electro luminescent wire that glows brightly with just a small amount of high voltage. One AA battery can power the Speed Vest for up to six hours, while a 9 volt can power the Amtel microcontroller for the same amount of time. So, you can ride with this jacket for a little while without having to worry about power. I don’t know if the inventors of this device plan on mass marketing this, but you would think they would use the same method of numbering that is used on LCD alarms and calculators. Otherwise, there is a lot of glowing spaghetti mixed up in the back of that jacket. Even if this does get mass marketed, I don’t know why you would want this particular device. I mean, if it was made a requirement for all bikers to wear so cops could check their speeding, then these numbers could be faked.